The Bluebird TA12 Towable Lawn Aerator utilizes the pulling power of your garden tractor to pull the aerator tine rotors through the soil. For this reason you will need an 18 HP lawn tractor to overcome the resistance of 4' of tines digging into the soil. In order to keep the tines in the soil, and not let them bounce up, sufficient weight is required to hold the aerator in place. This unit comes with six 5 gallon jugs that you will fill with water to gain an extra 288 lbs. No, you won't gain this weight - the machine will. The aerator comes with a standard tow bar to fit any lawn tractor. 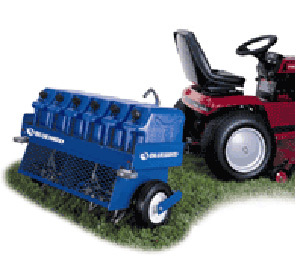 With a 48" wide path, the Bluebird towable aerator will cover lots of ground in a hurry. Production rates of up to 4 acres per hour can be achieved. The coring depth is controlled by a crank handle and can be adjusted up to 3" deep. These cores will lay on top of the ground and gradually break down and disappear within a week. The free wheeling tines let users turn reasonable corners while aerating. The towable aerator is fairly large so we will provide a trailer to help you transport it. You will need a 2" trailer ball and working lights hookup to pull it. If you or are just looking for a self-contained unit our ever popular Self Propelled Lawn Aerator is a great choice. If you need to rent a tractor to pull this, our 25 HP John Deere Lawn Tractor is also available. Aerating Depth Variable, up to 3"